Too quiet - you think to yourself. A message arrives in your Inbox, but not just any message. This message is adorned with the Red Exclamation of Importance! Hi everyone! Just a little reminder to get those TPS status reports in by next week. Also, we've change the passcode for next month's conference call – it is now 6661212. Oh. It's from that person. Every mail that person sends carries the Red Exclamation of Importance. Have you ever wondered what that person would do in the event of a real emergency? Hmm, I think you have less annoying people than I do. With my pests, it's alwasy marked as Important, sensitivity is set to confidential, they have a really annoying sig with the crap about confidentiality and deleting the message if recieved in error and of *course* the obligatory Read Reciept. No matter what, some people have this crap on everything - and they are always the same folks that think it's cool to CC the world whenever they think they've caught someone doing something wrong but are conspicuously quiet when it comes to their own issues. Ahh Scott, we're gonna need you to go ahead and come in this Saturday. Oh, and next Friday... is Hawaiian shirt day... so, you know, if you want to you can go ahead and wear a Hawaiian shirt and jeans. Personally, I've found email to have become passe. If they don't IM me on Messenger, then I usually make them wait until tney come over to my desk (all huffy and such). Some folks actually even get the message! I get those kind too but it doesn't bother me as much as the ones with the Read Receipt turned on. I hate those. And Outlook is so stupid that even though I've read it. Told it not to send a receipt then deleted it Outlook still prompts again when I clean up the delete folder. In a real emergency, that person would put a read and delivered receipt on the email message, alongwith the red expletive, I mean exclamation mark. Email is the bane of productivity. Wow... So this guy works at your company too? 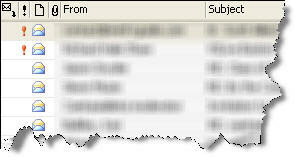 - the message title in the inbox IN RED! - a reminder popup AS SOON AS THE MESSAGE IS RECEIVED! It's fantastic! I swear by it! It's a good idea not to reveal the secret, otherwise Mr Exclamation (or Ms Exclamation - I've worked with several over the years) might upgrade his technique. Oops. Muhaha .. that's a good one ..
> Have you ever wondered what that person would do in the event of a real emergency? Probably up the ante to TWO red exclamation points. and marked as HIGH IMPORTANCE! Or you could always 'get them back' by sending an automated 'thank you for your important message' email in return, though this may be lost on some. I think I love you. Thanks to you, my day is 0.01% less annoying. Thank you!